North African food on the move! My name is Monem, I am a true Brightonian-Cariene mix. 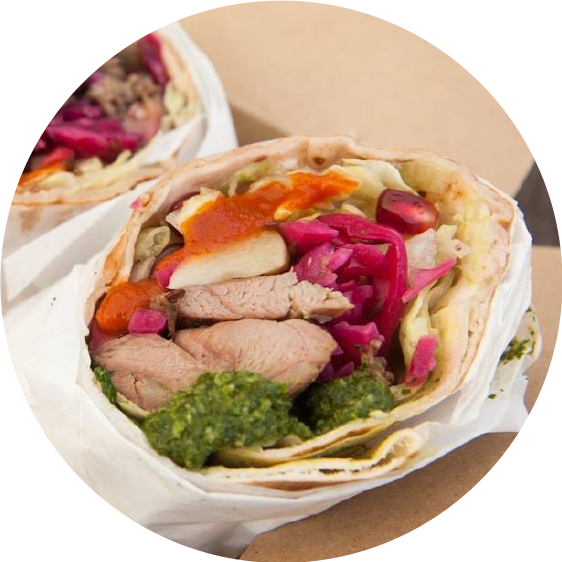 I offer a simple menu of 2 wraps beautifully balanced and deliciously flavoured. The foods I serve through the hatches of my Cairovan camper are traditional Egyptian recipes passed down through family from generation to generation. Cairovan is available for private hire. We provide a couple of services but are happy to tailor either of them to your personal wants and specifications. 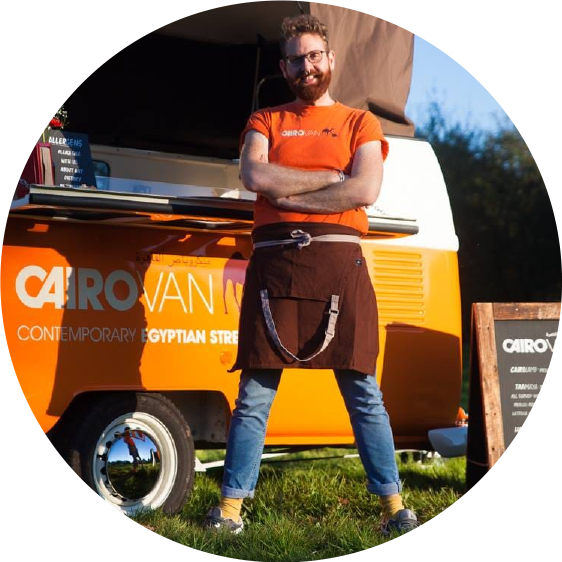 For your outside events (including garden parties, weddings etc) the cairovan team will come to your venue and serve our menu through the hatches of our eye-catching van. This can be done on either a pre-paid or pay as you go basis. For dinner parties, birthdays, and just why not (?! ), we offer a personal dining service from your kitchen. 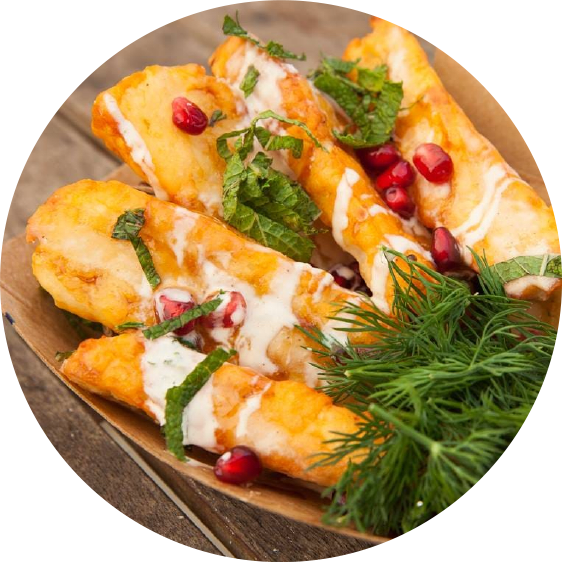 Serving an array of meze dishes to your table, eating in true Egyptian style! We will lay your table, serve your wine, and tidy up, so you can concentrate on the important things, like eating and drinking! I cook my lamb using Bubba Mansour’s recipe. This man lived to eat! His passion and excitement for food was contagious. His cooking rules were simple, cook slow, cook low and garlic, garlic, garlic… so that is what I do! All the lamb I use is free range and is sourced from our family farm in East Sussex. We firmly believe that a happy lamb makes a tasty lamb. Our family has been farming this land for five generations. Like the lambs, we too grew up roaming these fields, falling in ditches and getting chased by geese. Served with tahini, spicy chilli sauce, dill, pomegranates, spiced pickled red cabbage and crisp iceberg lettuce all contained in a warm soft flatbread. *For Gluten Free: Drop the Wrap and have a salad box. Topped with pomegranate seeds, pomegranate Molasses, fresh cut mint and Egyptian tahini sauce. Next up is Taameyya (Falafel to you and me). 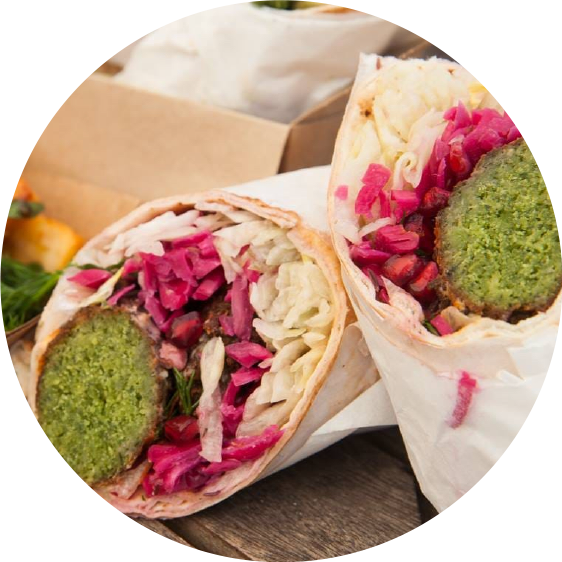 Falafel has humble beginnings over 1000 years ago as a peasant food. Our traditional Egyptian Taameyya is made using fava beans and plenty of fresh herbs and garlic. My patties are soft, bright green and cake-like in texture with a crisp brown shell. Their authenticity is thanks to a stint at my family’s local street vendor in Cairo. They are packed full of flavour and border on illuminous!